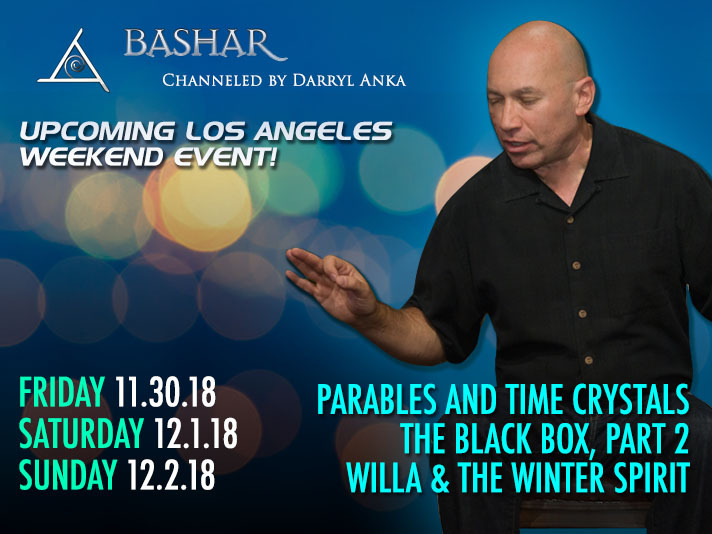 Bashar returns to Los Angeles for a Winter weekend intensive event! Join Bashar in these winter transmissions which will act as a holistic energy current that will propel you more smoothly in the direction of becoming more of your true selves, through the rapid accelerating energies of 2019, 2020 and into 2021. In this session Bashar will once again bring Willa Hillacrissing through to share specific details and a next step for cryptic training. In The Winter Spirit, Bashar introduced us to Cernunnos, the original spirit of giving. In this session Willa will expand on the possibilities for cryptics to work with Cernunnos and other nature spirits. This will prepare us for the journey into 2019, 2020, and 2021 in a joyful and empowered way. These sessions are designed to work together in a focused way for accelerated results. Bashar will join in for Q and A later in the transmission. *Early-bird discount expires 11-25-18. Regular price is $85. All ticket sales are final.